When it comes to cannabis, Canada is nice but the U.S. would be a lot better. In the aftermath of pot legalization north of the border, attention has turned to the world’s largest economy and the potential for a U.S. marijuana market that could be worth US$75 billion by 2030, according to an estimate from Cowen & Co. Entrepreneurs and investors who are flocking to the industry say legalization is inevitable in the U.S. 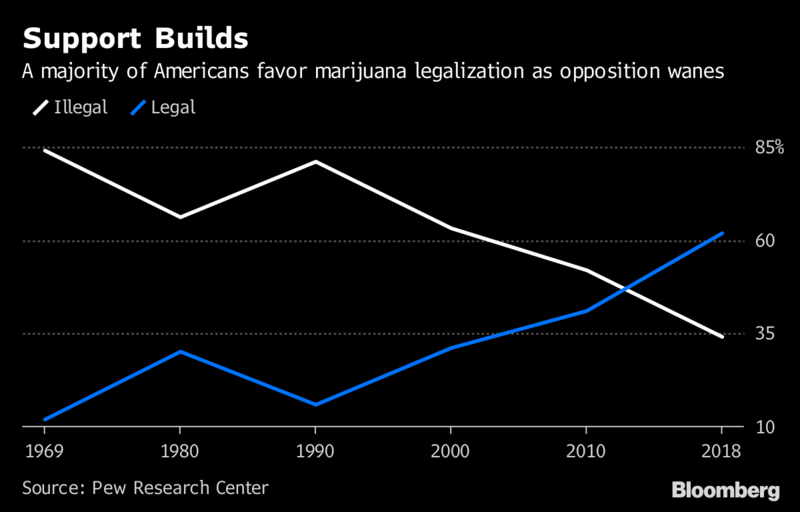 But while more than 60 percent of Americans support making pot legal, the politics remain fraught. Pot legalization is on the ballot in North Dakota and Michigan, while voters in Missouri and Utah will weigh in only on medical marijuana. Weed is currently legal for adult use in nine states and Washington, D.C., and with polls indicating the recreational measures are likely to pass, that would mean 25 per cent of the U.S. population will have access, according to Vivien Azer, an analyst at Cowen. Michigan would become the first Midwest state to legalize recreational pot. Adding two more medical states would mean almost 70 percent of Americans could use the drug for that purpose. Dana Rohrabacher, a conservative Republican from California who has said he uses medical marijuana to treat arthritis pain, told Fox Business recently that President Donald Trump was committed to legalizing medical marijuana after the midterm election, while leaving the question of recreational pot to the states. Attorney General Jeff Sessions has been a outspoken opponent of legalization, though reports suggest he may depart after the elections. Marijuana businesses in California, Colorado and other legal states are breaking the law, according to the federal government, which considers pot an illicit substance. The industry is looking for Congress to pass legislation that would formally make cannabis regulation a state issue. That would be akin to what happened when alcohol prohibition ended in the 1930s. Federal legislation for medical cannabis could mean that the government would “reschedule” marijuana -- taking it off a list of banned substances considered to have “no accepted medical use.” That could allow the Internal Revenue Service and financial regulators to soften their stance on pot, perhaps opening the banking industry and domestic stock exchanges to the industry. While Massachusetts, Vermont and Maine have legalized marijuana, recreational sales haven’t started in earnest on the East Coast amid delays in implementing retail regulations. Stores in Boston should be open any day, while legislators in New Jersey are debating a legalization bill that Governor Phil Murphy promised while campaigning for office last year. The expectation is that the opening of legal markets in states surrounding New York will force the hand of Governor Andrew Cuomo, particularly once residents of New York City can hop a quick train to New Jersey to buy weed, taking their sales tax revenue across the Hudson River. BDS Analytics has estimated that legal pot sales in the tri-state area could exceed US$5 billion by 2022, second only to California. In the industry, cannabis legislation is referred to as the “last bipartisan issue.” But even with broad support for making weed legal, the politics are tricky. While Republican support has been growing, it remains under 50 percent, according to the polling firm CivicScience, and opposition is stronger among older Americans. While many political analysts expect Republicans to keep control of the Senate, there are different opinions in the industry about whether it’s more favorable if the GOP continues to hold the House or if Democrats take control. Some argue that if Democrats win and push forward on marijuana, there’s a chance Republicans will dig in their heels and block progress. A single party controlling Congress might be an easier path for pot, especially if Trump gets on board, some say. The marijuana industry is watching a fight in Congress over US$867 billion farm legislation that includes funding for things like food stamps, rural development and agricultural research. The version of the bill passed by the Senate in June would legalize CBD derived from hemp on a federal level. CBD, a component of the marijuana plant that doesn’t get you high, is a trendy ingredient, finding its way into food, drinks and a host of beauty and health products. CBD, which is pitched as a stress reducer and pain reliever, is seen as an entry point for non-marijuana smokers curious about cannabis. Federal legalization might give large consumer companies, including Coca-Cola, an opening to dive in. The farm bill, which comes up for authorization every five years, expired on Sept. 30. Congress is expected to begin debating it again in the lame-duck session that will follow the elections.